Ray Samuels explains that only a few hundred Mini Cooper S Mark II cars like his were manufactured in the 1967 model year. The reason for the limited production, he says, was because most of the British-built cars were destined for the United States; however, the U.S. government altered the safety rules for the importation of the cars, which made any further production impractical. Samuels says evidence shows that his Mini’s original owner “used it up pretty good.” In 1975, after 39,000 miles the crankshaft snapped and the disabled car was parked with the intention that the engine could be rebuilt. By 1989, reality set in and the owner realized that he was never going to return the car to good health. 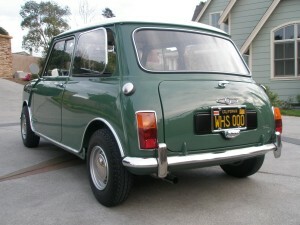 He advertised the 1967 Mini Cooper S Mark II for sale, which is where it captured the attention of Samuels. His offer was not promptly accepted, which puzzled Samuels until he learned the reason for the delay. The owner had a list of a couple dozen prospective buyers and he was interviewing each person to make sure his Mini went to a suitable home. “I was selected,” Samuels says. He quickly collected the Mini Cooper S Mark II and all the pieces of the disassembled 1.3-liter four-cylinder engine, loaded everything onto a flatbed truck and took all the parts to his Benicia, Calif., home. Samuels repaired the engine and with the Mini once more in working order he began regularly driving his nimble little car. He enjoyed its charms for about five years. During those years Samuels discovered that his vehicle was a relatively rare version of the Cooper S. That information — coupled with the low mileage — encouraged Samuels to have the rust-free car completely restored. 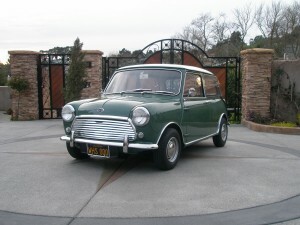 He had to wait a year for an opening at the Heritage Garage and then the week after Christmas 2003, Samuels delivered his Mini to the restoration facility in Costa Mesa. For the next four-and-a-half years the Mini Cooper S Mark II was thoroughly restored. During the summer of 2008 the 10-foot-long car rolled out of the shop on its 10-inch wheels supporting the 1,560-pound car on a wheelbase of 80 inches. It had been resprayed in the original colors, Almond Green on the body with a Snowberry White top. “It’s so nice,” an enthusiastic Samuels says. The headliner is white but the remainder of the interior is black. Both doors have two windows that slide to open and close. For additional ventilation the rear side windows are of the “pop out” variety. When the restoration of the Mini was completed Samuels attempted to locate the original owner, but was saddened to learn that he had died. When new, the vehicle had a base price of $2,800. Samuels believes the only optional extra on his car involves the reclining front seats, “It is a pretty spartan car,” he observes. “Since it is a Cooper S, it also is fitted with front disc brakes, an oil cooler, sump guard and wider wheels,” Samuels explains. A four-speed manual transmission helps squeeze performance out of the front-wheel-drive car. The speedometer tops out at 130 mph, a figure that Samuels has never seen.